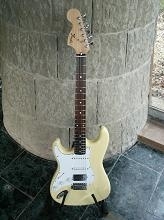 Mike Clement: Tony’s original Strat was white. It was originally a sunburst finish but Tony and his Dad spray painted it! It can be seen in the picture here and also in the film The Rolling Stones Rock and Roll Circus, made in 1968. For a brief period Tony played guitar in Jethro Tull and they are featured playing a song, nice hat Tone! He stopped using it when a pick-up went during the recording of the ‘Black Sabbath’ album. It was used on the track Wicked World. At that time you couldn’t buy pick-ups. Eventually he swapped it for a saxophone! One of the current two Strats is off-white, note the Tony Iommi Signature pick-up in the bridge position. The other is an American Deluxe model in a sunburst finish. The guitar used on Rock n Roll circus is not on neither of those pictures. First off, it had a rosewood fretboard, and secondly it had 3 BLACK pickups, not white. I purchased a 70’s suburst strat from a shop in Birmingham uk around 1990.I was told that it used to belong to Tony Iommi but quite honestly didn’t believe them. However years down the road and with the advent of the net I thought I would do a little research. With me here is the chrome scratch plate taken from that guitar with a label on the back.. Dawk Sound Limited, Freeville New York, dated 1980. Check out their website. 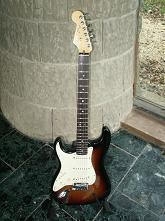 This sunburst strat is there. The guitar is now hanging on the wall in my studio.